A new drone called the Naviator, designed and built by researchers and students at Rutgers University, can fly or swim as needed. he Office of Naval Research commissioned this project in the hope of creating a new vehicle capable of rapid deployment for a multitude of missions. For example, a combination quadcopter-sub could inspect bridge foundations, investigate undersea pollution, or perform search-and-rescue operations. This first prototype is merely a proof of concept that has a few development hurdles to overcome. Those include scaling up to a size that can support relevant payloads like cameras and sensors. 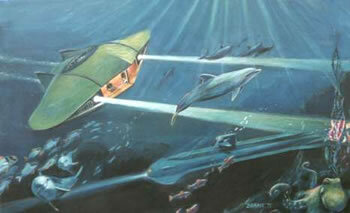 Underwater dynamics must also be improved to allow increased maneuverability and depth. Because radio transmission through water is difficult, the craft must be tethered at this time to provide continuous communications. Even so, it's easy to watch this demo and imagine an unmanned autonomous drone that can be programmed to accomplish a mission that requires it to swim and fly. Also, check out the Navy's Cormorant program, which is working on a similar kind of technology, but going in the other direction, as well as the more recent Flimmer drone program. Via PopMech; see also an earlier release and prototype at Rutgers.